Please note our ALL STARS summer programme for 2019 is SOLD OUT. Other local clubs may be offering a similar programme. Outdoor nets recommence from April. Watch this space for more details as the season approaches. 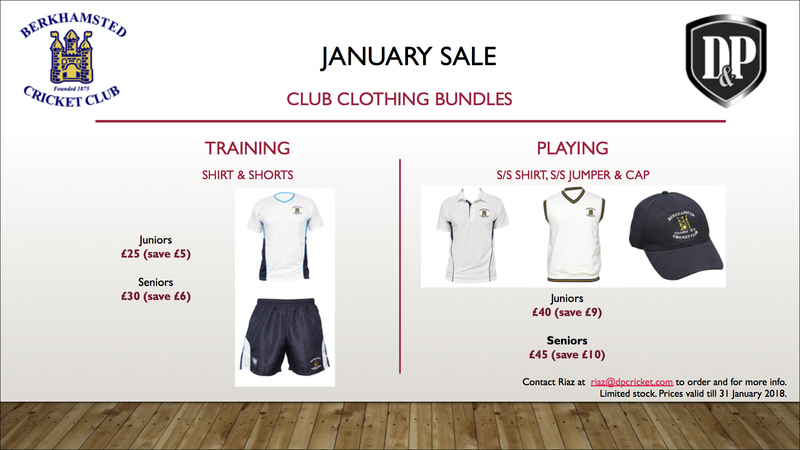 Training kit is available directly from the clubhouse through our partners, D&P Cricket, and you can contact Riaz to purchase. * Hoodies available early May. Outdoor training gets underway on Tuesday 9th April and will continue weekly from 6pm to 8pm. Please update your availability for friendlies on the 20th and the first round of the National Cup on the 28th of April. And if you haven't paid your subs yet now's the time! We are always pleased to welcome new members to the Club. Whether you are a player, supporter, coach, scorer or umpire you will be welcomed by the Club. Over the last few years our membership has increased in size significantly and we are always hoping to increase this further. Anyone can play cricket for us, whether you're a top level player or a total novice. To find out more take a look at our Looking to join a cricket club page. To hire the clubhouse for your function or event, see the Clubhouse Hire page for contact details here. This site currently holds all the stats for the 2008 season onwards. For stats prior to 2008, our old site is still available for your analysis by following this link.